Keith Lanier Tucker, 77, died Thursday, March 31, 2011 with his family after a full and involved life. He was born Nov. 1, 1933, in Ukiah, Calif., to Charles and Ina Tucker. Growing up in Fresno, he graduated from Roosevelt High School in 1951, and went on to attend Fresno City College, playing football. After distinguishing himself, he was recruited by Len Casanova and went to Eugene to play football for the University of Oregon Ducks. He earned All-Pacific Coast honors as a senior, playing both ways at tackle. While attending the University of Oregon, he met his future wife Anita Fish. they were married in the summer 1955 after he had graduated with a degree in education. He was promptly drafted by the U.S. Army. He served at Fort Ord, Calif., playing football for the Army. Their daughter, Susan, was born while they were living at Fort Ord. After leaving the U.S. Army, he came to The Dalles with his young family in 1958, taking a biology teaching position that included coaching football. He was selected to continue as head coach in 1960, which he did for the next five years. He then took a hiatus from coaching that would last 39 years before he once again returned in 2004 to coach his grandson, Rick’s, youth league football team. After working summers in the local cherry industry, he was hired to manage the Stadelman Fruit Company plant here in The Dalles in 1966. Through the following 16 cherry harvests he became a respected leader in the Northwest fruit industry. He had taken a personal stake in the cherry business by then, buying a couple of cherry orchards. In 1982, he and his wife moved north to Oroville, Wash., where Keith joined in a partnership to manage a large apple operation in the Okanogan. By 1987 he had grown this business to involve over 600 acres of apples and pears. Returning to The Dalles in 1988, he and his wife settled in as full-time cherry and apple growers and full-time grandparents to their three grandchildren. He loved being involved with his grandchildren and all their activities from school to sports to the many piano recitals. He is survived by his wife, Anita; his daughter and son-in-law, Susan and David Maier; and his grandchildren, Meghan, Madeleine, and Rick. A celebration of his life will be Monday, April 11, at 1:30 p.m. at St. Peter’s Parish Center. In lieu of flowers, the Keith Tucker Memorial Scholarship has been set up at Columbia State Bank to benefit students graduating from The Dalles-Wahtonka High School. Classmates' rememberances are welcome here. Contact Jim. Lester “Bud” T. Jensen, 86, a retired teacher who taught two generations of English and literature students at The Dalles High School, and a longtime resident of The Dalles, died at a local care facility on Tuesday, March 17, 2009. He was born in Denver, Colo., on June 5, 1922, the second of three children to Adolph and Lillian (Brand) Jensen. He grew up in Denver, Colo., and Minot, N.D. He graduated from Minot State Teachers College with a bachelor’s degree and University of Oregon with a master’s degree. He served with the U.S. Navy as a lieutenant junior grade in both World War II and the Korean War. He taught high school English and literature for 39 years at The Dalles High School. He married Betty Jane Mercer in Santa Ana, Calif., on April 2, 1944. They have lived in The Dalles for 60 years. 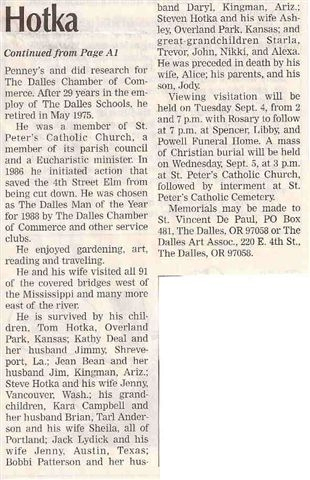 He was a member of Calvary Baptist Church (Trustee, Building Committee), OEA, NEA., USS Point Cruz Assoc., Wasco County Library Board, The Dalles Country Club and Kiwanis. He enjoyed golf, theater, photography, travel and literature. He is survived by his wife of 64 years, Betty Jane Jensen; daughters, Helene Fremstad and her husband Fredrik, Knappa; and Christine Wallace and her husband James, The Dalles; daughter-in-law, Donna Jensen Lawrence, The Dalles; grandchildren, Kristian Fremstad and his wife Jennifer, Erik Fremstad, Stig Fremstad, Nathan Sutton, Scott Sutton, Stephen Sutton, Ashley Baker and her husband Mike, Amber Wallace, Greg Jensen and his wife Pam, and Jeff Jensen and his wife Jodie; great-grandchildren, Annik and Fridtjof Fremstad, Jaegar and Jacek Jensen, and Jadelyn Collum; his sister, Mildred McDonough and numerous nieces and nephews. He was preceded in death by his dear son Mark, his parents Adolph and Lillian, and his sister, Dorothy. Lester T. Jensen was interred on March 25, 2009 at Willamette National Cemetery in Portland. A celebration of life will be held April 4, at 1 p.m. at Calvary Baptist Church in The Dalles. Memorial contributions may be made to Calvary Baptist Church Mortgage Fund or to The Dalles-Wahtonka High School Lester T. Jensen Scholarship Fund. The morning sun broke out of the east early and bathed the Klickitats in a yellow butter. There was no wind coming from either direction, so the April spring birds were free to announce that today would be a memorial for Lester T. Jensen. At 1pm, the Calvary Baptist Church in The Dalles was filled with friends, fellow teachers, past students and family. His grandson, Greg (Mark's son), told the gathering that Les remembered every student, their nicknames and would tell his 8 grandsons, who he called the "Great 8", all about these past students, their antics and their nicknames. Walt Smith, who still retains his dry wit, told stories of his fellow English teacher and how they both became golfers after retirement. In particular, he said Mr. Jensen had a bad habit of asking right in the middle of Mr. Smith's back swing, "Now, where are you going to hit this one?" He said that he could imagine Les in heaven, finally playing a round of golf with God. And he had a warning for God. Just when he was in full back swing, Les was going to ask that question. Of course, the class of 1963 was well represented with Niki Wassem and Jan Muller as well as others from other classes coming from out of town. Les was buried in Willamette National Cemetary last week with a full Navy honor guard. He served in both WWII and Korea. wow...little did we know then how true that statement would become. At that time I thought 1984 was going to be the end of us all or something.. We lived through it and beyond. Also he loved to tease me, whether it be at school or school events or when I would be at the Jensen home. I think he had some sort of nickname for me, but at the moment I can't think of it. I think he loved teasing all of us, especially the girls. "He was a wonderful man," said Jim Taylor, who was coached by Miller in the 1950s. "I was a foster kid and I set the high school discus record, and Al was just a real treat. When I met him again when I moved back to The Dalles in 1992, he said he didn’t know that I was a foster kid. He said, ‘If I’d known, you’d have been living with us.’"
"The biggest thing about Al was his smile," Taylor added. "I’m going to miss him." Miller was a physical education teacher, teaching for a year in Spokane, and for 30 years at The Dalles Junior High. He started The Dalles High School cross country team and coached high school track for more than 33 years.
. "They were crying for teachers at that time," Miller said in a 2005 interview. He wasn’t the first track coach at The Dalles, but he organized the program into a competitive team. 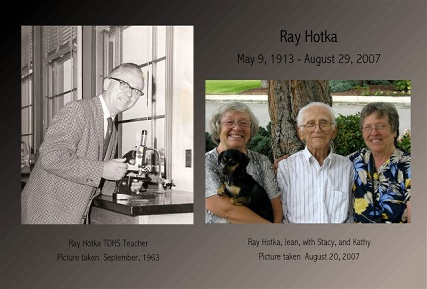 He encouraged and mentored his students over the years. After retirement, Miller returned to track coaching. He coached Beau Bailey, who graduated in 2002. "I thought he was an excellent coach", Bailey said. "He seemed to care deeply about everyone’s progress, even the kids who were not very good at their events. He would still spend time helping them develop and focusing on growth." He was born on April 17, 1927, the youngest of three children to Glenn E. and Barbara A. (Higgins) Miller in Portland. He grew up in Parkdale, attending Parkdale schools, and attended Whitworth College in Spokane, graduating in 1952. He earned his master’s degree from Lewis and Clark College in 1978. He served in the Army during World War II, and married Betty J. Dockter on Dec. 20, 1954, in Berkely, California. In addition to teaching, he had a second career on his family’s orchards. 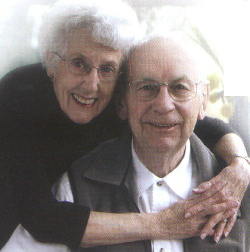 He was a member of Gateway Presbyterian Church, and enjoyed church activities, sporting events, attending his grandchildren’s sports activities, playing golf, traveling to Arizona in the winter months, reading, flying, and was a World War II history buff, as well as a helper and volunteer to those in need. Mr. Miller is survived by his wife of 53 years, Betty Miller, The Dalles; children Glenn Miller and his wife Linda, Parkdale; Kristie Jacobs and her husband John, Seattle; Tracy Miller and his wife Carol of Oakridge, OR, Garth Miller and his wife Claire, The Dalles; grandchildren Joel, Taylor, Amanda, Hannah, Amy, Megan, Marie, Audrey, John, Jenna; brother Chad Miller, The Dalles; niece Barbara Miller, Parkdale; and nephew Donald Miller Jr.. The Dalles. Al will be remembered most for his infectious smile, his sense of humor, and his love of people, his family noted. "He always took time to listen, whether to his family and friends, or to the many students and athletes he taught over the years. If someone needed help, Al was right there, or he provided other means. His actions exemplified the Christian faith he so strongly believed in. Al lived his life with a sincerity, warmth, and love of people that is rarely seen today," they wrote. A viewing/visitation will be held on Thursday, Feb. 14, from 2 p.m. until 7 p.m. at Spencer, Libby, and Powell Funeral Home. A memorial service will be held on Saturday, Feb. 16, at 1 p.m., at Gateway Presbyterian Church, with pastor Jim Hazlett officiating. Arrangements are in care of Spencer, Libby, and Powell Funeral Home. In lieu of flowers, memorials may be made to the Gateway Presbyterian Church building fund, 1111 Dry Hollow Rd., The Dalles, OR 97058, or to The Dalles-Wahtonka High School track and field program, in care of Jerry Christenson, 220 E. 10th St., The Dalles, OR 97058.